DIE Sabbati, videlicet, 14 Maii. Ld. Morley's Trial for killing Captain Clarke. Captain Kirke's Trial for the same. Bill to restrain Peers made hereafter from sitting or voting in Parliament. Colonel Beeling to be examined. Middlesex Militia to be trained on Friday. Message from the H. C. for the Depositions concerning Colonel Goring. Ordered. For Committees to meet, about an Answer to the King. Committees to send for Examinations concerning Colonel Goring. Sir Tho. Carey versus Bp. of Ardagh. Lord Privy Seal sat Speaker this Day. "That the Way of proceeding against a Peer in Parliament Time, especially in Causes Capital, is to be by Way of the House of Commons, by Impeachment from them; and the Trial to be by Peers." Ordered, That this House declares, That, in Parliament Time, a Peer ought to be tried in Parliament by his Peers, and no where else; and the Impeachment or Accusation must be brought from the House of Commons. Ordered, That Mrs. Clarke shall petition the House of Commons, touching the Lord Morley, concerning the Death of her Husband, Captain Peter Clarke. 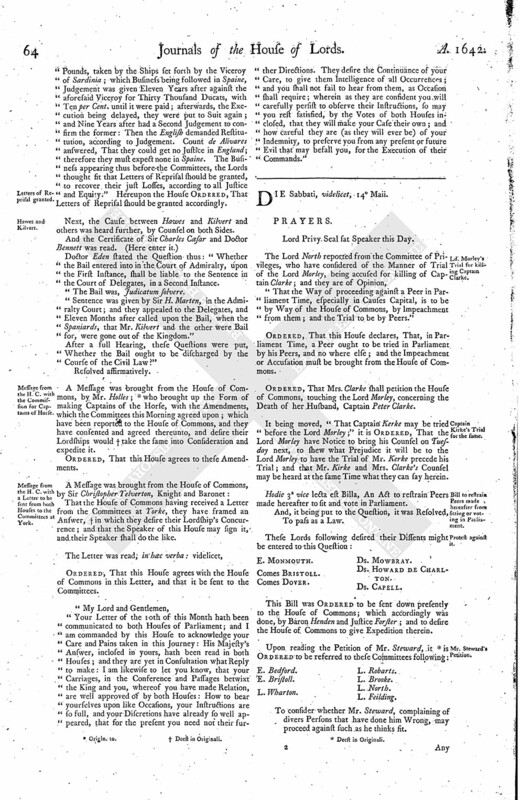 It being moved, "That Captain Kerke may be tried before the Lord Morley;" it is Ordered, That the Lord Morley have Notice to bring his Counsel on Tuesday next, to shew what Prejudice it will be to the Lord Morley to have the Trial of Mr. Kerke precede his Trial; and that Mr. Kirke and Mrs. Clarke's Counsel may be heard at the same Time what they can say herein. Hodie 3a vice lecta est Billa, An Act to restrain Peers made hereafter to sit and vote in Parliament. And, it being put to the Question, it was Resolved, To pass as a Law. This Bill was Ordered to be sent down presently to the House of Commons; which accordingly was done, by Baron Henden and Justice Forster; and to desire the House of Commons to give Expedition therein. To consider whether Mr. Steward, complaining of divers Persons that have done him Wrong, may proceed against such as he thinks fit. Any Three to meet on Monday next, Two postmeridiem; and whether Persons in Ireland complained against may not make their Answers. To consider of the Consequence of this Proceeding, in regard of the Generality of it. This House being informed, "That Mr. Serjeant Fynch had, according to the Order of this House, taken divers Examinations of sundry Persons, touching Colonel Beeling;" it is Ordered, That the said Examinations shall be delivered to Mr. Justice Heath, who shall forthwith go to The Tower, and examine the said Colonel Beeling. Hodie 3a vice lecta est Billa, An Act to enable the Re conveyance, or Sale, of the Manors of Earsham, etc. to the Executors of the Lord Viscount Banning of Sudbury, deceased. And, being put to the Question, it was Resolved, To pass as a Law. The Earl of Holland signified to this House, "That he hath appointed Friday next, for the Training of the Trained Bands of Midd. according to the Ordinance of both Houses of Parliament, for settling the Militia of this Kingdom." 1. That the House of Commons desires, that the Depositions concerning Colonel Goring may be delivered to the Committee. 2. To desire that the Committee appointed to prepare an Answer to the King's Messages may meet with the Committee of the House of Commons. Ordered, That the Committees shall have Power to send for the Examinations concerning Colonel Goringe. Ordered, That the Lords Committees shall meet this Afternoon. Ordered, That the same Committee that amended the Commission for the Troops of Foot shall also consider of the Commission for the (fn. 2) Horse. "That William late Bishop of Ardagh, on the 19th of July 1632, in Consideration of a Surrender of Twelve Cartrowns of Land, and Two Rectories, unto the See of Ardagh, which were formerly demised unto the Plaintiff for the Term of a Thousand Years, did, in Obedience unto an Order of the Council Board in Ireland, of the 15th of December 1630, demise unto the Plaintiff One Rectory, and Eleven of the said Twelve Cartrowns, at the Yearly Rent of Five Pounds, Six Shillings, and Eight Pence, for the Term of Three Lives; which Lease was confirmed by the Dean and Chapter. "By an arbitrary Order of the Council Board in Ireland, of the 12th of November 1635, the Plaintiff was dispossessed of both the Rectories, and Six of the said Eleven Cartrowns of Land, and the Possession thereof given to the Defendant; the Term of the other Five Cartrowns of Land was then reduced from Three Lives to One and Twenty Years, and the Rent imposed upon the Five Cartrowns was Ten Pounds per Annum. 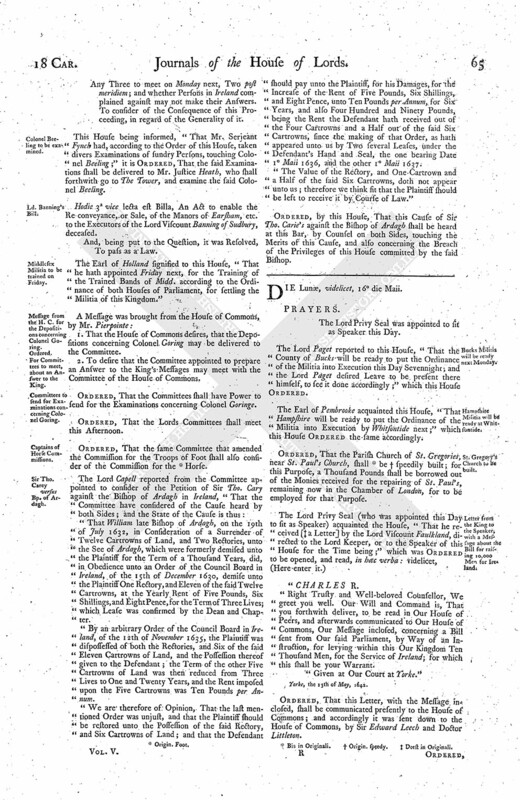 "We are therefore of Opinion, That the last mentioned Order was unjust, and that the Plaintiff should be restored unto the Possession of the said Rectory, and Six Cartrowns of Land; and that the Defendant should pay unto the Plaintiff, for his Damages, for the Increase of the Rent of Five Pounds, Six Shillings, and Eight Pence, unto Ten Pounds per Annum, for Six Years, and also Four Hundred and Ninety Pounds, being the Rent the Defendant hath received out of the Four Cartrowns and a Half out of the said Six Cartrowns, since the making of that Order, as hath appeared unto us by Two several Leases, under the Defendant's Hand and Seal, the one bearing Date 1 Maii 1636, and the other 1 Maii 1637. "The Value of the Rectory, and One Cartrown and a Half of the said Six Cartrowns, doth not appear unto us; therefore we think fit that the Plaintiff should be left to receive it by Course of Law." Ordered, by this House, That this Cause of Sir Tho. Carie's against the Bishop of Ardagh shall be heard at this Bar, by Counsel on both Sides, touching the Merits of this Cause, and also concerning the Breach of the Privileges of this House committed by the said Bishop.